The City of Sainte-Anne-de-Bellevue is blessed with several green spaces where wild animals can live in peace. Among these are the Anse-à-l'Orme Nature Park, the Morgan Arboretum and the Bois-de-la-Roche Agricultural Park (Senneville), all three open to the public. The Anse-à-l'Orme Nature Park is a linear park of 233 hectares is partially landscaped. It is a territory that is home to wet meadows, marshes, old abandoned farmland, forests and Rivière-à-l'Orme. Hundreds of species of birds and animals live there, some of which are endangered and rare. The centennial forest has been designated exceptional forest ecosystem (EFE) by the Quebec Ministry of Natural Resources and Wildlife. The Morgan Arboretum, a 245-ha preserve of woods and fields owned by McGill University, provides a perfect home for many species. From short-tailed shrews to white-tailed deer, Arboretum experts estimate that 29 species of mammals, 15 species of reptiles and amphibians, and just over 200 species of birds are found on the territory (including many breed there), making it one of the most diverse regions on the island of Montreal. The agricultural park of Bois-de-la-Roche is a rural domain representative of the farms of the west of the island of the beginning of the century. With an area of 191 hectares - the area of Mount Royal - most of the park has an agricultural vocation and the other part remained in the natural state. Feeding a wild animal can be perceived as a generous gesture, but it is important to refrain from it, both for the welfare of the animal and ours. The majority of wild animals are healthy, but some of them may carry infectious diseases such as rabies, likely to be transmitted to humans. It is not enough to try to distinguish the sick animal from others, because - contrary to what one might think - a sick animal is not always aggressive and may seem rather amorphous and docile. In any case, an unexpected reaction of the wild animal is always possible, whether it is sick or not; we must remain vigilant and keep our distance. Moreover, food consumed by humans is not necessarily appropriate for wildlife. Our foods often have little nutritional value for animals and can even be harmful to their health. Bread and treats, for example, can cause serious obesity problems and interfere with their activities, including bird migration in the fall. Feeding wild animals has the effect of reducing their autonomy; they can become dependant on this artificial source of food and passive in the face of foraging in the wild. In addition, diminishing wildlife's natural fear of humans can lead to many other conflicting situations, such as increased movement across roads, increasing the risk of collisions with a vehicle. Despite all the good intentions, feeding wild animals is far more harmful than good. To support the fauna and facilitate its observation, the development in one's yard of a small garden favorable to the biodiversity or the installation of a bird feeder during the winter period (when the fruits of the trees are no longer available) are more appropriate avenues. In general, when it comes to observing wildlife, the basic rules must be kept: keep a healthy distance and avoid behaviors likely to influence the regular activities of the animal in its natural environment. In conclusion, if you enjoy wild animals, do not feed them and let them continue their activities... naturally! 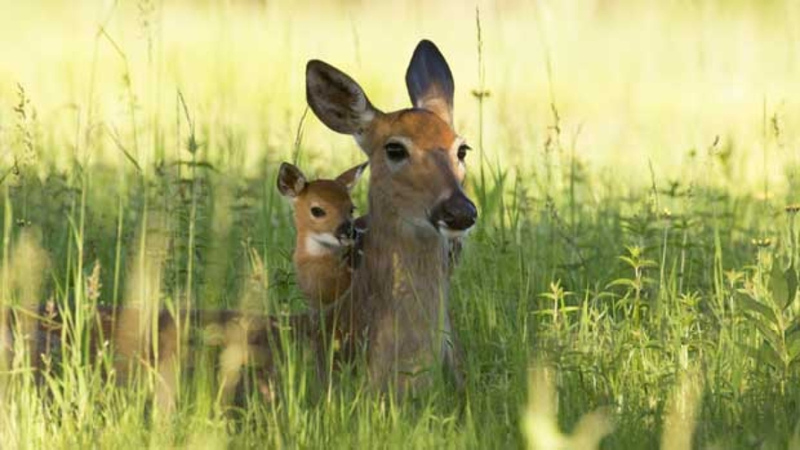 According to municipal by-law number 770 on nuisances and safety, it is forbidden to capture, feed or pose any act intended to provide shelter to a wild mammal on the territory of Sainte-Anne-de-Bellevue. The City of Montreal also has a regulation to this effect: the feeding wildlife is prohibited under the By-law concerning the use and preservation of regional parks of Montréal (09-029). Offenders are liable to a fine of up to $4,000. The coyote has expanded in recent years and has been reported in new areas including the Anse-à-l'Orme Nature Park and the Bois-de-la-Roche Agricultural Park. We would like to inform you about the measures to be taken to promote coexistence with this animal that adapted life in an urban environment. Report the presence of coyotes in your area by calling the Info-coyotes line, 438-872-COYO (2696), or by completing the online form available on Ville de Montréal's website. This information is essential for planning appropriate interventions to ensure a harmonious coexistence. The coyote can transmit certain diseases to humans, such as rabies. What to do if you cross a coyote? Move away by slowly backing up and keeping eye contact with the animal. Avoid turning your back on him. Do not run.